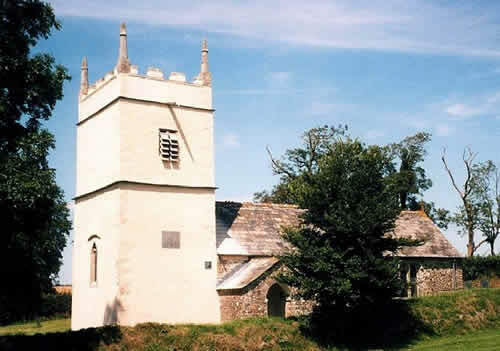 Believed to have been built in the 14th century and now, since 1979, a redundant church cared for by the Churches Conservation Trust. The tower is a Grade 1 listed building. Luffincott is a parish in the valley of the River Tamar and on the western border of the county, four miles west from Ashwater station on the Launceston and Tresmeer branch of the Southern Railway and 7 miles from Holsworthy, in the Tavistock division of the county, the Hundred of Black Torrington, petty sessional division, rural district, county court district and rural deanery of Holsworthy, archdeaconry of Totnes and diocese of Exeter. The church of St James is a small and plain edifice of stone, consisting of chancel, nave, south porch and an embattled western tower with pinnacles at the angles, containing 3 bells, of which the first is an alphabet bell from A to I; the second bears an invocatory legend to the Virgin in Lombardic characters; the third is dated 1625; on the south side of the tower is a slate slab bearing an inscription recording the rebuilding of the tower in 1791 ; above is the name "John Trible Churchwarden". In the floor of the of the aisle is a stone to the memory of James, son of Rev .Joseph Whithorne, a former rector who died in 1701. The church was partially restored and reseated in 1893, when a new altar table of carved oak was provided; there are 70 sittings. The register of baptisms dates from the year 1659; that of marriages from 1653; that of burials from 1664. The living is united with that of Tetcott, with a joint net yearly income of £373, and is in the gift of John Molesworth St Aubyn sq and held since 1937 by the Rev Hedley Thomas Milman B.A. of London University who resides in The Manor and is the principal landowner. The soil and subsoil are chiefly clay and the main crops are wheat , barley, oats and root crops. The population in 1931 was 68.